Dr Jotham Scerri Diacono, Dr Jan Rossi and Dr Julian Caruana of GANADO Advocates’ Shipping team assisted the buyer that has been awarded the right to acquire the superyacht following judicial proceedings instituted in the Maltese Courts. The sale of M.Y Indian Empress, a 95 metre superyacht, generated a substantial amount of media attention given the history of creditors and crew members that were seemingly left unpaid and that led to the yacht’s arrest in Malta several months ago. 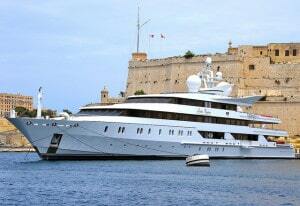 The luxury vessel was reportedly ‘abandoned’ last year by its previous owner. Since then, much interest was generated in yachting circles and attempts, albeit unsuccessful, were made for the yacht to be sold by court auction. The saga finally came to an end earlier this week, when on the 25 September the court authorised the sale of the yacht to a buyer for the price of €35 million. The sale was completed the following day and the price has been deposited in court to serve as a fund for the crew and creditors to finally get paid.